Eri Crum’s victory in the World SpeedGolf Championship, held at the Bandon Dunes Golf Resort last weekend, got me thinking about all the golf derivatives that seem to have sprung up in recent years. 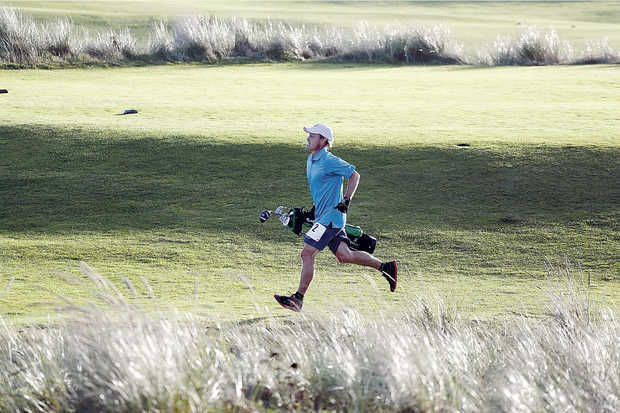 For the record 39-year-old Crum, a former Stanford University golf captain and the runner-up in the 2013 Championship, shot a 4-over-par 76 in 46 minutes and 1 second for a SpeedGolf total score of 122.01. He earned $10,600 for his impressive performance and win in Oregon. Whilst I don’t want to knock anything that is golf-related I have to admit to getting a bit tired of all these different versions of ‘golf’. If golf remains at the heart of the matter then fine. Who can argue with hickory golf or for that matter miniature golf. However, if you want to kick a football, go running or throw a frisbee into a metal net then do it but keep golf out of it. Golf is golf and doesn’t need hijacking. It may not be perfect and could certainly do with being a bit quicker at times but we just don’t need all of these distractions in my view. This entry was posted in Golf Miscellaneous and tagged Disc Golf, FootGolf, Golf, SpeedGolf. Bookmark the permalink.